There is no medical definition for a “superfood”. Food manufacturers are eager to use the word to promote sales of their products that contain traces of supposed superfoods such as blueberries, pomegranates and chocolate. The Oxford English Dictionary defines a superfood as “a nutrient-rich food considered to be especially beneficial for health and well-being.” However, there are no set criteria about what makes a food nutrient-rich. Most superfoods are high in antioxidants and phytonutrients relative to other foods. However, if you were to eat only one of these superfoods to the exclusion of all else, you would be seriously deficient in many of the nutrients your body needs in order to stay healthy. So what exactly is the science behind the idea of superfoods? While we would like to believe that if we eat certain foods we can stave off illness and keep aging at bay, the truth is that it’s not so easy. Although there is no doubt that a diet consisting primarily of fruits and vegetables is one of the keys to healthy longevity, it is also what you don’t eat and do that is important. 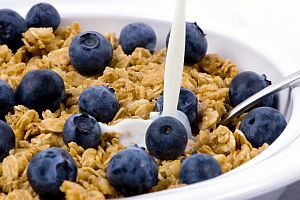 For instance, if you eat a breakfast of blueberries and pomegranates in a bowl of oatmeal, along with a cup of green tea, that does not mean that your health will improve overall if for lunch you have a bucket of fried chicken, French fries and a 64-ounce Coke, followed by a cigarette. The majority of scientific studies indicating that there may be some positive health effects associated with the nutrients contained in certain foods were conducted in a laboratory. In general, high levels of nutrients are used in these studies—usually far more than what can be consumed in a normal diet. For instance, the compound resveratrol that studies have shown to be heart-healthy and to guard against prostate cancer is found in grape skins only in very small amounts. So although “the French paradox” (why the French have low rates of heart disease despite a rich diet) is often partially attributed to the regular consumption of red wine, in fact, you would have to drink 40 liters of wine a day to get the same amount that was shown to benefit the health of mice in these studies. The positive results of studies performed in test tubes on a few human cells and studies performed on mice do not necessarily translate into health benefits for the wider population. The effect of a single nutrient on human health is difficult to pinpoint, as we all eat a combination of foods. Some nutritional benefits may only occur in the presence of other nutrients in the same food, or even in a different food eaten at the same time. Iron absorption, for example, is boosted when a food rich in vitamin C is eaten at the same time.